— If it’s candy, beverage or fruity food, I’ll choose citrus hands down, in the following order: Lime. Lime. Lime. Lime. Lime. Lemon. Orange. — And if it’s candles, room sprays, lotions or potions, I’ll drool over anything involving cinnamon, vanilla, or any other flavor resembling something that could be coming out of my oven. There are, however, 2 exceptions to this rule. Ben & Jerry’s Ice Cream and DQ Blizzards. When it comes to those 2 things, my heart, soul and love handles belong to cherry–chocolate and they always will. It’s a little habit that comes from my Mom and to this day I still think of her every time I eat that luscious combo. 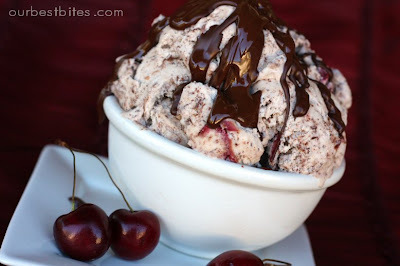 And then I couldn’t stop thinking about cherry-chocolate ice cream. I don’t have a lot of prep pictures because I was making it up as I went and didn’t know how amazing it would taste until I was done. But all you really need is the finished product anyway, right?! I’ve blabbered enough today. Let’s do this thing. If this looks familiar, it’s because I swiped the custard base (and a picture…and some text…) from Kate’s Snickerdoodle Ice Cream. She won’t mind; we’re close like that. Combine milk and sugar in a medium saucepan. Heat over medium until bubbles form around the edges. Remove from heat. In a small mixing bowl, whisk eggs thoroughly. Very slowly, add 1/2 of the hot milk mixture, whisking the yolks constantly. Return pan with remaining milk mixture to stove top and then whisk the egg and milk mixture back into the saucepan, whisking constantly. You need to be careful here to not get the eggs too hot too fast, or else they’ll curdle. Add whipping cream. Over medium-low heat and stirring constantly, continue heating the custard mixture to 160 degrees. It will start to thicken quickly. A good trick to test the custard mixture is to dip a spoon in and run your finger down the back of it. When your finger leaves a track, it’s ready. Once ready, remove from heat and add chopped cherries immediately. Add vanilla and almond as well. Let the custard cool (you can use an ice bath if you want to speed that process up) and then place in the fridge to chill for several hours. I usually make custard bases for ice creams the day/night before I want to use them. Or in the morning if I need it for that night. It takes quite a while for the mixture to get well-chilled, and it really will churn better if it’s super cool. So try to plan ahead so you can get the custard part out of the way. That way when you want to make an ice cream (and eat it soon after) you can whip it together in no time. Once the custard is cooled and chilled, pop it in your ice cream maker and churn according to manufacturer’s directions. While ice cream is churning, grate the chocolate. 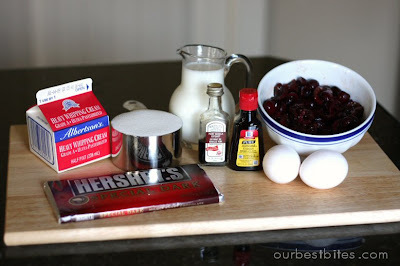 I use one of those large-sized Hershey bars (as seen in the picture of the ingredients). You’ll use 3/4 of the bar. That’s all but one row of those little squares. Why you ask don’t I just use the whole bar? Because this way it leaves 4 squares for eating. I know you, and you’re going to eat it anyway. And if you don’t, then your kid or husband will steal some before you’re done. Since I’m a real person I account for things like that. Aren’t I great? I adore chocolate. Like, I’m kind of obsessed with it. But I HATE frozen chunks of solid chocolate in ice cream. They’re like little rocks in something that should be creamy and smooth and once it’s frozen, you can’t even really taste it. So that’s why we’re using shaved chocolate and not chopped chocolate or chocolate chips. It’s so tiny that it distributes all the way through the ice cream and when it hits your tongue it just melts into chocolaty goodness. 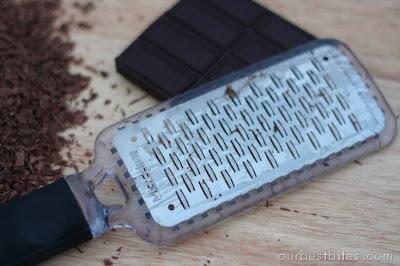 My favorite tool for grating chocolate is this microplane grater. But a regular ol’ cheese grater will suffice just fine. 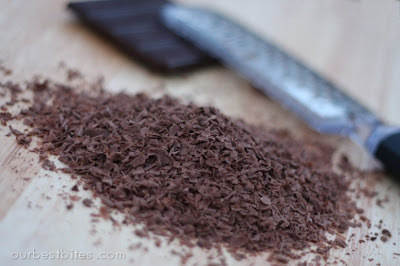 Add the chocolate shavings into the ice cream when there’s just a few minutes left. If you wait too long and it’s already to thick to really mix it well, just stir them in by hand as you transfer your ice cream into another container. Chill in the freezer for a few hours and then devour. And if you’re really wanting a foodgasm, just top it with some of this. 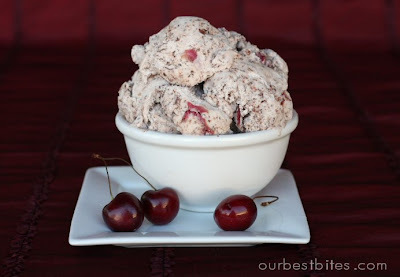 What are you waiting for–go pick some cherries! And then check out this post if you’re not sure what to do with them. Since I’m sure someone will ask about frozen or canned cherries, yes I’m assuming they’ll work (although I’ve obviously never tried it.) If using frozen, measure fruit while still frozen. If using canned, drain well and then measure out a bit less than the recipe calls for–about 1 1/2 cups. And let me know how it goes! In a small mixing bowl, whisk eggs thoroughly. Very slowly, add 1/2 of the hot milk mixture, whisking the eggs constantly. Return the pan with the remaining milk mixture to the stove top and then whisk the egg and milk mixture back to the saucepan, whisking constantly. Be careful not to heat the eggs too hot too fast, or they’ll curdle. Add the heavy cream. Over medium-low heat and stirring constantly, continue heating the custard mixture to 160 degrees F. It will start to thicken quickly. Once ready, remove from heat and add the copped cherries immediately. Add vanilla and almond extracts as well. Let the custard cool (you can use an ice bath if you want to speed that process up) and refrigerate, covered, for several hours. Once chilled, transfer the mixture to an ice cream maker and churn according to manufacturer’s instructions. While the ice cream is churning, grate the chocolate. Add the chocolate shavings into the ice cream when there’s just a few minutes left. If you wait too long and it’s already too thick, jsut stir them in by hand as you transfer your ice cream into another container. Freeze for several hours before serving. Makes 1 1/2 quarts. My new fave is Heavenly Hash. Chocolate ice cream with swirls of marshmallow and chunks of chocolate covered almonds. So good! my DQ blizzard fallback is strawberry oreo…mmm. But I'm with you on the PB one too…that and the RR chicken teriyaki. I'm definitely a cherry choc lover! We should be friends! Mint Chocolate Chip… always mint chocolate chip! YUM! Moose tracks, Bunny Tracks…anything with vanilla ice cream, peanut butter, and real creamy milk chocolate. None of that chocolate syrup. I love mint oreo shakes/ice cream. Simple, but awesome. My fall back is definitely a mint oreo or any type of berry swirled in vanilla ice cream (think blueberry cheesecake or our local dairy has a marionberry pie flavor… yum!). I also love the Klondike White House Cherry ice cream bars. Mmm mmm mmm. I think I will have to try to your ice cream recipe. Thank you!!! Allright my absolute favorite place to get Ice Cream is Cold Stone, because you get to add anything you want to any base ice cream. I've been going for years. I started getting upset, because I was never able to finish even a small size (Like It). I have found the best combo, it is so delicious and I can order a large (Gotta Have It) and finish it. Okay here goes, the best flavor combo is… Cheesecake Ice Cream with Brownies and Raspberries, mixed it. It is HEAVEN in a bowl. If you haven't tried it, you really need to sometimes I change it up with using their Cake Batter flavor ice Cream, but I can never finish this one, it gets too sweet. Pralines and Cream is my absolute favorite, it reminds me of my mom. I'm going to say something really brave, I'm not really an ice cream fan. I can have it twice a year and call it good. My husband on the other hand can eat it every night and never get sick of it! I do love me some cherry chocolate chip, although I had an unfortunate morning sickness-related incident during my last pregnancy and I don't think I've had it since. 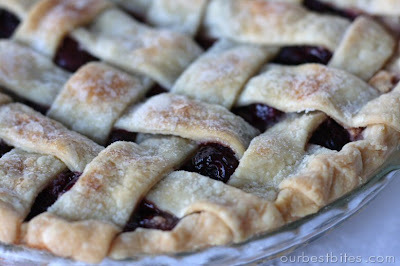 However, I DO have some cherries that I need to use up, so tomorrow may be my day! First let me say, WOW. I don't think anything has ever looked so delicious and I would do just about anything to try some of that! OMG! I'm glad I checked your blog today! I'm risking sounding like a 5 year old, but honestly my fall back is rainbow sherbet. I love anything sweet & sour. But this cherry chocolate looks heavenly. OMG that looks so YUMMY. You're making me really want an ice cream machine! I gotta say, my ABSOLUTE favorite is cinnamon ice cream. I know it sounds boring, but it is SO GOOD; delicate and delicious with the vanilla-cinnamon combination. If I'm in the grocery store and can't get cinnamon ice cream, my fall back is Haagen-Daas's Rum Raisin. YUM. Baskin Robbins made a winter white chocolate ice cream. It was my hands down all time favorite (then they closed the baskin robbins) so i'm excited to make this! Baskin-Robbins-Lemon Custard; Kroger-Moose Tracks; Freddy's-Turtle Sundae…etc. Baskin Robbins Peanut Butter Chocolate is my favorite ice cream of all time. Since you love chocolate and PB you must try if you haven't already. Rocky Road is my favorite store bought brand and my favorite mix in has to be cookie dough. Love, love, love ice cream. I can never pass up Pistachio if it is available…although your recipe is making me rethink that. Next time I may have to try some form of cherry chocolate because I have never had it before. Oh my that ice cream looks good! Yum! Love the recipe concept and your techniques. I make a version with coconut milk, but I drip melted chips over the ice cream and churn it in. Irish Cream with Raspberries from Coldstone!!! Good thing my birthday's coming up, cause im totally gonna ask for an ice cream maker!! So much for losing that last bit of baby weight…. Crazy but true I've never tried chocolate & cherries together. Your ice cream looks good in that its not a chocolate ice cream. My fall back is definately cookies n' cream. 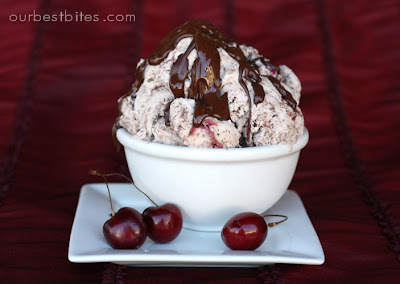 But this chocolate cherry looks amazing! Note to self… buy an icecream maker soon. Cake batter ice cream is the best! Oh, I always struggle choosing between Butter Pecan, Mint Chocolate Chip and Cookies&Cream. I see others recommending the Mint Oreo. I bet that is good, it would blend 2 of my favorites! I also love B&J's Cherry Garcia, my husband likes it too. He's not a big chocolate or ice cream fan but once in awhile he gets the desire and that's usually the flavor we get. I have made this twice now. The first time was so-so, but I made some small mods to the recipe and Wow! Thank you so much for the recipe. My family loves it! I have also made the Caramelized Banana and the Mango Sorbet. What can I say? It has been hot here in Washington! Glad I found your blog. You made me laugh with your talk of fall back flavours – so true. Okay the chocolate cherry has me interested but I warn you I hate making and am not good at custards! I always end up over cooking it. I am going to try the tip with the spoon a try. I know this is totally weird but I love, love, love blueberry-oreo ice cream. I used to work at an ice cream shop and I would mix up oreo ice cream with blueberries. Heavenly. Here's another weird one for you: Cookies and cream ice cream mixed up with cherrios. Yep you read that right…cherrios. So good and so weird. So…for Christmas my husband bought me the icecream maker attachment for my kitchenaid stand mixer….Will this recipe work in that as well? Absolutely Rachel! It works just as a table top ice cream maker would so you can make any of our ice cream recipes- have fun! my fallback is always oreo! yum! Definitely anything coffee flavored. I don't drink coffee, but I LOVE the flavor! Congratulations on your sweet babe. May all go well. And… your ice cream recipe looks fabulous! 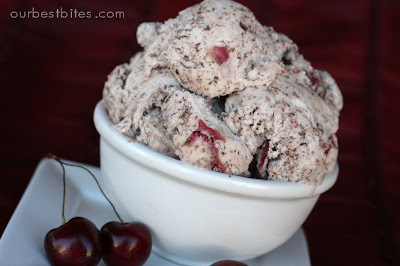 omg It's like homemade Ben & Jerry's Cherry Garcia!! I will def be making this! Oh my! I can't wait to try this! I've had an ice cream maker in my kitchen for 5 years and have never used it. THIS makes e want to pull it out RIGHT NOW! Thanks, ladies! Passion fruit and chocolate is what i always pick, it's amazing! Oh yum Sara, now that's the proper send off to baby land : ) I can't wait to see the pictures, thanks for always sharing even in the midst of birthing babies!! OH.MY.GOSH!!!!! Cherry Bordeaux is my FAVORITE and they stopped selling the good kind at my local grocery store. I am going to make this for everything! I'm with you, when it comes to any ice cream, it's vanilla. But Ben & Jerry's it's Cherry Garcia OR Mint Chocolate Cookie. Usually I can't decide and end up with both. I can't wait to make this recipe. Having a pool party next weekend, may try it out then. Sara, you said you love lime and obviously ice cream, so you NEED to try the LIMITED BATCH of Ben and Jerry's "Key Lime Pie"!! No joke, it is amazing (as all their flavors are). I can't think of a better way to recover after having a baby surgically removed from your body than with a few pints of that stuff! My other faves of theirs are Cinnamon Roll (oh my heavens!!) and Mint Chocolate Cookie-who can resist those whole oreos covered in ice cream?! Hope you can find that limited lime flavor, good luck with your baby! I love this gelato down the street called Banana Split – which is really just Banana gelato with chocolate shavings and a swirl of caramel. Delicious. Yeah, chocolate is my #1 dessert choice about all the time… unless there is the chance for ice cream (which I usually choose the chocolate based flavor anyway. I can't wait to try this recipe but I wonder – how many servings is this? When I read about your favourite flavours, it was like I had written that myself. Wow, great minds think alike! DH and I were on our way home from a wedding yesterday, and we stopped in at a Marble Slab Creamery for a cone. I chose their 'Almond Joy', and it was fabulous. I usually have their white chocolate ice cream with coconut, Heath Bar®, and pecans. It's really expensive, and totally divine, but yesterday's attempt to get out of a rut and try something new had a very satisfying end. Nom nom! I like caramel ice cream, I used to get it every couple of days from Marble Slab during my 1st pregnancy! –or at home I do vanilla or choc. chip. Ha Ha! I read my husband the first paragraph of the post about flavors and he laughed like crazy. Said you were actually talking about me and how did you know! He likes to tease me about my panic attacks at Carl's Junior when I fall back on my "Teriyaki please" half screech. When I spent the whole drive there telling him I'm going to pick something else. Same with Cold Stone. Can't help it! They make me the happiest. Glad to know there is someone else like me. Congratulations on the baby! I have 2….depending on my mood. Cookies and cream, but only if it's actual oreos with the white centers (not just some chunk of random black filling-less cookie)…or Pralines and cream (I love caramel)especially Baskin Robbins. Now I want ice cream…. Congratulations on having your little one! Best of luck. Oh wow! I have a big cherry tree. Thanks for the idea! Momblog- 2 yolks is correct. Thanks for the catch! I don’t know what I did wrong, but the ice cream never did set up. I froze it according to my freezer directions and I’ve made non-custard ice cream many times with no problems. This is the first custard-ice cream I’ve made. I was very disappointed!